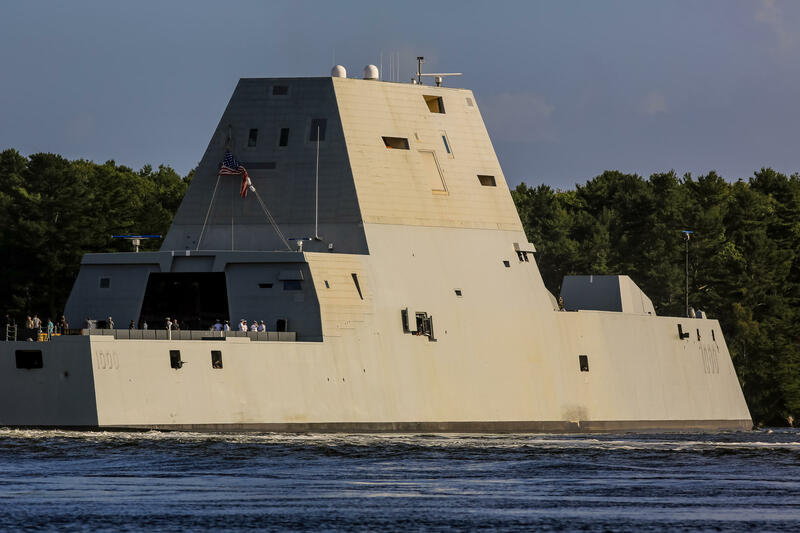 USS Zumwalt off Arrowsic in September. President-elect Donald Trump says he wants to bolster the nation’s military with more ships, planes and ground forces. Even if he is only partially successful, it could mean a big boost to Maine’s defense contractors and to the state’s economy. Defense industry jobs generally pay well. While the average per capita income in Maine is less than $28,000 a year, the average pay at Bath Iron Works is over $51,000 a year. That’s one reason why some see Trump’s proposals to increase defense spending as having the potential to boost the state’s economy. There are about 270 ships in the U.S. fleet, and Trump says he wants a 350-ship Navy. Andrew Hunter of the Center for Strategic and International Studies in Washington says building ships takes a long time. “The quickest way to deliver more ships is to order more of what you already got in production,” he says. And that could mean more orders for Burke-class destroyers, which are built at Bath Iron Works. A new class of ships, such as the future frigate discussed in the trade press, could take a decade to design and get into production. Brian Slattery of the Heritage Foundation says there’s talk of changing strategy around the new class. “Folks are thinking how can we evolve that Littoral Combat Ship, the LCS program to something that more resembles the frigate that it had replaced,” he says. There were 71 Oliver Hazard Perry-class frigates built for the Navy — 24 of those at Bath Iron Works, which was the lead yard for the ships. In addition to growing the fleet, Trump has also signaled that he wants to bolster U.S. air power. That could be a boon for the Pratt and Whitney plant in North Berwick, which builds engines used in the F-35 jet fighter. Trump has criticized the aircraft as being too expensive, with a price a tag of over $100 million apiece. But Hunter says it’s already in production. “The F-35 is basically the only game in town when it comes to buying new fighters for the U.S. Air Force,” he says. The North Berwick plant also builds engines for the B-21 bomber that is under development, at a projected cost of more than half a billion dollars each. Beyond ordering new ships and planes, Trump could also reach his goals by extending the lives of current weapons systems, Slattery says. And that could mean more work for the Portsmouth Naval Shipyard in Kittery. “With respect to submarine platforms, they’re looking at ways to extend the service life by nature of having a nuclear power plant that can operate longer,” he says. Trump also wants to build up ground forces in both the Army and Marine Corps, adding tens of thousands of troops. That could benefit smaller contractors in the state, from athletic shoemaker New Balance to the General Dynamics plant in Saco that makes machine guns and grenade launchers. Maine’s two U.S. senators both support Trump’s efforts to improve the military, but express concerns about the cost — pegged at hundreds of billions of dollars over several years. Republican U.S. Sen. Susan Collins, who serves on the Appropriations Committee, points to a national debt in excess of $19 trillion. “It will be interesting to see what the president’s budget is and how he proposes to shift funding in order to pay for that needed improvement in our naval fleet,” she says. Independent Sen. Angus King, who sits on the Armed Services Committee, agrees with Collins that the military is underfunded. But he too is concerned about how Trump plans to pay for his new and expanded programs. “Really don’t know what the proposals are, what the offsets might be. But the reality is we are already running a half trillion a year budget deficit and that is expected to run into the indefinite future,” he says. The short-term funding for the operation of the federal government runs out in April, at about the same time the new Congress will have to focus on Trump’s first budget proposal, which should take effect next October.